Melody Johnson felt heartbroken at having to bring her 83-year-old mother—who had diabetes, high blood pressure and incontinence—to an Oklahoma nursing home in 2009. The Anadarko resident wasn't focused on the stack of papers the nursing home handed her family upon admission. She and her family didn't realize a binding arbitration agreement was among those documents. The agreement said any claims against the facility would have to go to arbitration, not to court. The family didn't fully understand what they had signed until they tried to sue Grace Living Center Chickasha after the death of their mother, Arda Lee Churchill, in 2011, which Johnson alleges was a result of neglect. Ultimately, the matter went to the Oklahoma Supreme Court, which refused to enforce the arbitration agreement, saying that the family member who signed the agreement on Churchill's behalf didn't have the authority to do so. A lower state court is now examining the merits of what has become a wrongful-death case. Some say the Jones family situation is typical when it comes to binding arbitration agreements. Though some patients, their families, attorneys and patient advocacy groups have been battling binding arbitration agreements in nursing homes for years, the vast majority of nursing homes now use them, said Greg Crist, a spokesman for the American Health Care Association, an industry group. Industry groups and their lawyers argue the agreements are a useful tool for saving patients and facilities time and money—cash that is better spent on patient care. But families frustrated by the quality of care their loved ones sometimes receive at homes say they often feel pressured to sign them and don't understand what they're agreeing to. They don't realize that awards in arbitration in nursing home cases are usually lower than those reached in court. 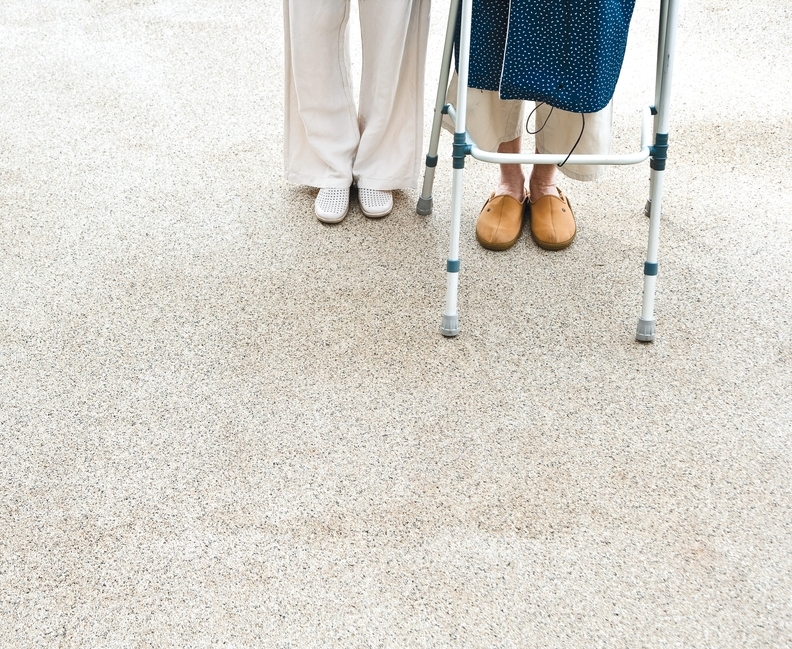 Claims settled in arbitration have clearly been a good deal for nursing homes. 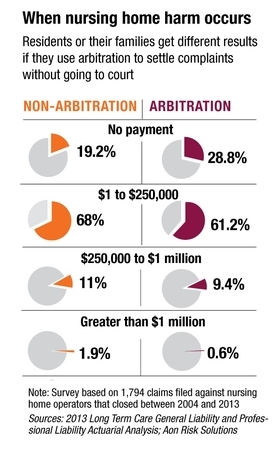 Agreements reached out of court cost about 16% less on average than claims that do not involve arbitration, according to insurance broker Aon Global Risk Consulting. Now, a new CMS proposed rule aims to put an end to the long-running feud over the use of binding arbitration agreements in nursing homes. The rule would require nursing homes serving Medicare and Medicaid beneficiaries to explain binding arbitration agreements to patients and families before they sign them. The rule also would prohibit nursing homes from requiring residents or their families to sign the agreements as a condition of admission. The Obama administration's proposal follows failed bills in Congress to invalidate the agreements in nursing homes and a CMS memo issued more than a decade ago that argued such agreements, when required as conditions of care, might compromise residents' quality of care and could violate federal requirements. There's general agreement that a rule barring facilities from requiring arbitration agreements is long overdue. But while industry representatives generally support the proposed rule, parts of it have left some trial lawyers and patient advocates fuming. They say it might create some legal gray areas for patients and facilities, such as leaving room for interpretation when it comes to what might constitute adequate explanation of binding arbitration agreements. They also worry the rule would legitimize even wider use of the agreements in nursing homes. The proposed rule says that if a nursing home asks a resident to sign a voluntary binding arbitration agreement, the facility must make sure residents understand what they are signing. “While this can be a valid agreement when entered into by individuals with equal bargaining power, we are concerned that the facilities' superior bargaining power could result in a resident feeling coerced into signing the agreement,” according to the proposed rule. Crist said the association supports the rule. It has consistently discouraged its member nursing homes from using the agreements as a requirement of admission. Drew Graham, a partner at Hall Booth Smith who represents nursing homes, said providers generally are already explaining the voluntary agreements to prospective residents. “They're very careful about who signs it and careful to explain it,” Graham said. Even if the rule were to become reality, some question whether the requirement that the agreements be explained would make much of a difference. Steven Levin, a plaintiffs' attorney at Levin & Perconti in Chicago, said those explaining the agreements often don't fully understand them themselves. Nursing home claims costs are increasing about 5% a year, with an average cost of about $220,000 a claim, said Christian Coleianne, an associate director and actuary at Aon. Many large nursing home chains are self-insured, meaning they pay claims up to a certain amount and then have insurance to pay claims beyond that amount. Stephen Ware, a law professor at the University of Kansas, argues that rather than eliminating arbitration agreements in nursing homes entirely, it makes more sense to continue to allow them and let courts decide when they're enforceable or not by looking at the facts of each case. “It's helpful if the costs of resolving disputes go down, and I think, generally, arbitration works pretty well to do that,” he said. But Johnson's case shows how leaving that decision to the courts can create problems, said Johnson's attorney, Ray Maples with Maples, Nix & Diesselhorst in Edmond, Okla. The legal battle in that case has now lasted nearly four years because of disputes over the arbitration agreement and other issues. Johnson said it seems as if the nursing home is dragging out the case. Such delays can be frustrating to families, especially in nursing home cases that often involve elderly patients and relatives for whom time is of the essence, plaintiffs' attorneys say. But Johnson said she doesn't believe binding arbitration agreements should be allowed in nursing homes. “We didn't even realize what we were signing,” she said.